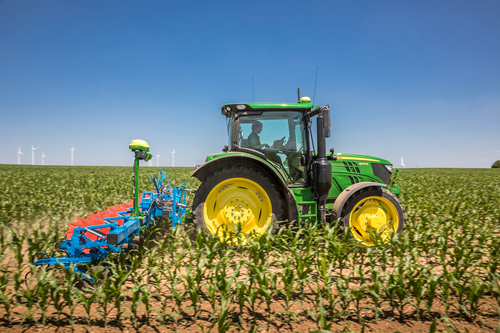 John Deere’s new tractor integrated AutoTrac Implement Guidance system steers both the tractor and row-crop cultivator by combining a camera with GPS steering for high speed, high output weed control. The time window for optimal mechanical weed control is very limited. John Deere and its subsidiary Monosem have therefore developed an active, integrated implement control system for inter-row hoeing. The system enables very high working speeds of up to 16kph without damaging the crop. AutoTrac Implement Guidance uses a camera mounted on the hoe which calculates the predicted track along the plant rows. In addition, a John Deere StarFire satellite receiver is attached to the hoe. Steering control is thus achieved using an RTK signal and is useful where plant rows are uneven or interrupted. All information is shown and settings entered on the tractor’s CommandCenter display. Sideways movements of the hoe are governed by an electro-hydraulic control unit on the tractor. In contrast to other complex positioning units, this system works with a hydraulic side stabiliser on the lower links, while the three-point hitch’s upper link position is continuously monitored. The AutoTrac Implement Guidance system steers not only in straight rows but also on slopes and around corners. Corrections and cross shifts of more than 500mm of the hoe’s tools are possible, while two hydraulic disc coulters ensure precise tracking accuracy, especially at high speeds. The patented coulters are fixed onto the tractor’s hitch block and absorb the forces of both the tractor and the attached implement. The tractor is controlled in the same way, with both the camera and StarFire GPS receiver mounted onto the cab. In hybrid mode both systems complement each other perfectly. When used in combination with John Deere’s iTEC Pro headland management system, complete automatisation of weed control is possible.